Movies in the classroom… you know you’ve shown one before. I was guilty of it too when I was in the classroom. As an administrator I do not necessarily want my teachers showing films to students – unless they relate to the standards of course. So when a film relates to the content and we want to use it to provide a visual for concepts already taught; how do we ensure that students stay engaged throughout? How do we ensure that students stay awake when the lights are off and engaged in the viewing process? The answer is a tool that I used in the classroom; I called them film engage assessments. I used @Socrative as the driving force and delivery method. If you are not familiar with Socrative, check it out here. As students watched a film in my class, we would use Socrative and I would run a teacher-paced quiz on my student’s devices. For this example we will use the film Glory as the example. The Socrative Share Code is: SOC-594065, if you want to run it in your Socrative teacher dashboard. The engage assessment consists of ten open-ended short answer questions. Because this is a teacher-paced assessment, I would launch the questions as the students got to the scene they related to. Students would use their devices (Socrative runs on ANY web enabled device) to answer the question. 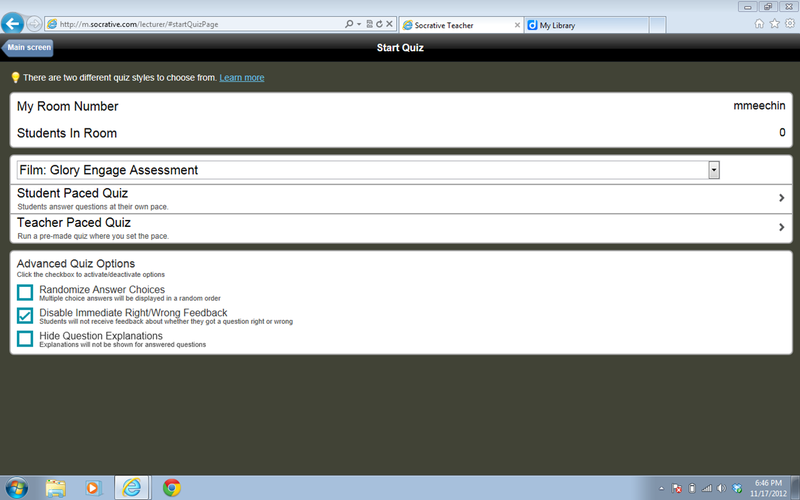 Socrative allows you to email or download a report of all student answers at the completion of the assessment. I would use the report to guide discussion at the conclusion of viewing. Keep in mind that this strategy would work with and length of film – from short video clips to feature length films. It is an easy way to keep our students engaged while they view pieces of film in our classrooms.